So what was my “anniversary post” to be? It’s not like I forgot the anniversary itself. It was the day I opened my mail and read in sickening disbelief the change in terms notice that Chase sent to me. On December 3, 2008 I responded. 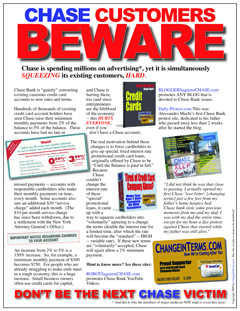 No matter how much advertising Chase can buy, thereby suppressing the truth about its unethical actions in the mainstream media, I won’t let Chase forget, either. I have plenty to do at work right now (it’s final exam week). However, rest assured that I’ve been “making my list and checking it twice,” and I know all too well that banks and their lobbyists have been very, very naughty, and not at all nice. The popular uproar continues, while the the back-room negotiations with “our” elected officials continue to feed “fat cat” bankers at the expense of small businesses, taxpayers, the economy, you, my family, and me. I’ll have more to say on all of these things. ← ChangeInTerms.com site poll finds 97% of respondents have experienced abusive treatment from a credit card company “for no reason” (meaning, the customer did not do anything wrong). I just received my 6 page revised agreement. It looks as though Chase is setting a new minimum payment at 5% on all cards. They also put in capital letters a clause stating they will raise the minimum monthly payment anytime they want for any reason. There was no opt-out clause or even the rights to opt-out within the revised agreement. On the topic of derivatives, how about $91.3 trillion worth (as of November 2008)? Do you think Chase has learned its lesson? According to Jamie Dimon, in his testimony to the Financial Crisis Commission on January 13, 2010, a financial crisis occurs every five to ten years (he should know, Chase usually has something to do with it) and people really shouldn’t be surprised. If they are so easy to predict then why can’t they be prevented? Isn’t that why the Federal Reserve was created? Unbelievably, nobody mentioned the fact that Mr. Dimon was the head of the Fed during his testimony. What a farce! Chase is listed at #82. A. M. correctly identifies derivatives as the investment shell game vehicle which has been responsible for the fleecing of America. Those who speculated were burned, those who didn’t were compelled to share as victims when their representatives authorized government bailouts. Barney Frank and Cris Dodd are working furiously to amend the legislation meant to restrict the practice with a concept called “swap execution facilities” which would allow exemptions to the proposed restrictions. Why aren’t people mad about the masquerade? Why does america elect such thieves? Because all of derivatives profits are made “off the top”, the banksters can then make political donations to keep the politicians in their pockets so they can keep coming up with new derivative scams. if Banksters were only allowed to take a very small percentage from a derivative on a year by year basis, it would not make sense to come up with derivatives that may tank after a couple of years since they would be losing a potential thirty year source of residual income. If Banksters are allowed to “skim” off the top when they create a derivative then they really won’t hold themselves accountable since they got most if not all of their money at the very beginning of the deal rather over the life of the deal. This gets back to the rescinding of the Glass-Steagull Act. Glass-Steagall separated local banking activities from derivative investments. Glass Steagall prevented Derivative shenanigans from being co-mingled with local mortgage money. Derivatives are turning out to be the single biggest evil form of “investment” that there is. In essence bankers skim money off the top and then resell the accounts they skimmed money as derivative investments. The problem is the derivatives take so long to pay off that there is no guarantee they will pay off yet the bankers took their profit at the beginning of the transaction. The bankers, by getting their cut off the top at the front end, are free to do with what they want with their ill gotten money. As the derivatives fail, the banksters can then use the off the top profit to buy back these failed derivatives for pennies on the dollar. It would be like the fireman on the train who puts coal into the trains furnace suddenly throwing paper into the furnace so the train slows down, is surrounded by bandits and robbed. That’s basically how derivatives work. A derivatives product based on carbon credits – SCARY! Trust JP Morgan Chase to be in on this. Thanks for the two excellent referral links above. I have taken the liberty of providing a “permalink” to the AnonymousBanker.com post you mentioned above in comment #2. This is the roll call of the vote on the Minnick of Idaho Amendment – an amendment from Walt Minnick (D-Idaho) to the Wall Street Reform and Consumer Protection Act that sought to abolish the Consumer Financial Protection Agency (CFPA).